Throughout my geeky history, I've been an awful lot of things... a Magic card player, a Pokemon addict, a Civilization builder, a "Second Quest" completer. I've had more PDA's and cellphones than I can count and have a pretty extensive vintage game collection. I can't get enough of Apple products, qualifying for "fan" but falling short of "fanboy." But, until now, one thing I have not really gotten into is television. That's not to say that I never looked upon my friends' ReplayTV or TiVo units with jealousy, or that I never watched TV - but more that I was never really a TV "geek." DVR technology has been available for quite some time, and you could say that I'm a "late adopter" here. What's great about the EyeTV is that it solves every one of my issues and gives me lots of freedom with my shows, with no monthly fees - an exciting solution for DVR noobs like me, or veterans as well. Basically, the EyeTV is a DVR and analog/digital TV converter for your Macintosh computer. It will take the signal from your cable or antenna (including ClearQAM signals) and allow you to watch television on your Mac. 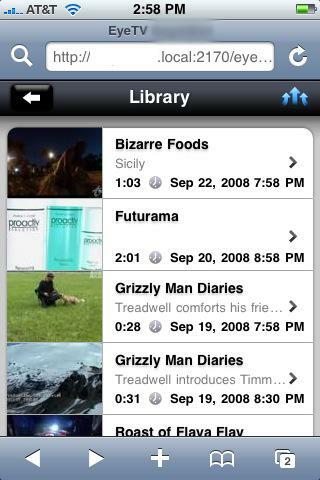 You can record shows, export them in a variety of formats, and stream to your iPod Touch or iPhone, or use with various media streamers/extenders. 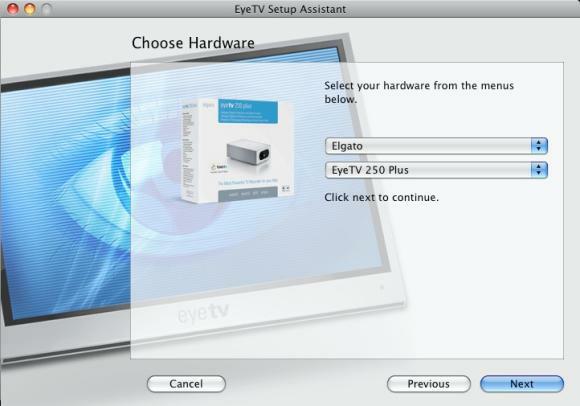 You can even use the EyeTV 250 Plus on your main television, by connecting your Mac directly and using the included remote. Note: The EyeTV hardware is not compatible with Windows or Linux and is designed specifically for Macintosh operating systems and computers. Exporting to iTunes and Other Formats - Here, we discuss how to get your TV shows into iTunes, and how the EyeTV can be used to make videos viewable on other devices such as the PSP. Streaming your library - This section talks about how the EyeConnect software can be used to watch your library on your home network via your iPhone or iPod Touch. Editing your recordings - You can also use the EyeTV software to edit your videos, allowing you to save clips, or remove commercials. Are you pumped up yet, Mac people? Let's get started. 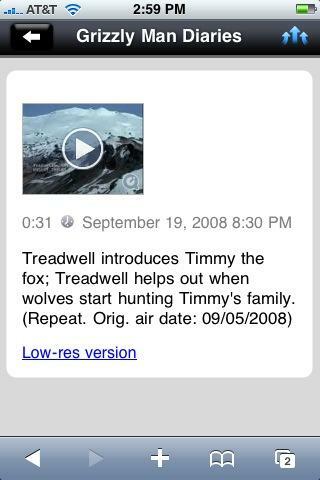 I experienced a strange mix of excitement and skepticism when I first laid my eager mitts on the EyeTV. Excited since it promises so many great things, and skeptical because I wasn't sure if it would convert this somewhat "non-TV" guy into a devoted tube-watcher. 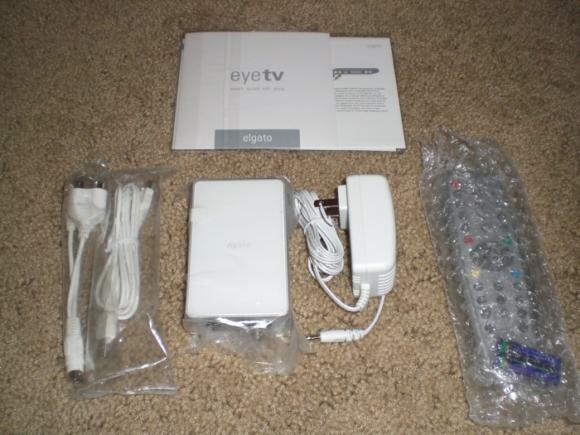 Unboxing the EyeTV 250 was similar to any unboxing - which for me, is exciting and deliberate. I gingerly removed each neatly-packed component. 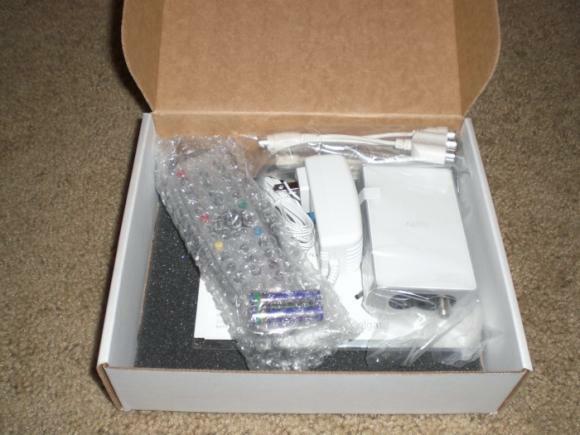 The box includes the EyeTV unit, some connection and power cables, a quick start guide, an installation CD, and a remote - all the items that I expected to receive. In addition, it's loaded with powerful recording features that allow you to record shows onto your hard drive, export them to iTunes or a myriad of other formats, and even stream videos to your iPhone. Without hesitation, I immediately proceeded to insert the installation CD that came with the device. The installation process went quickly and smoothly, and guided me through every step of the way. Note: You can also use external devices, such as cable boxes, with the EyeTV 250 Plus, although I did not do so in the scope of this review. Of course, at this point, I was really eager to get my first recording underway. Without really setting up any options, I decided to dive right in and see how this baby rolled. 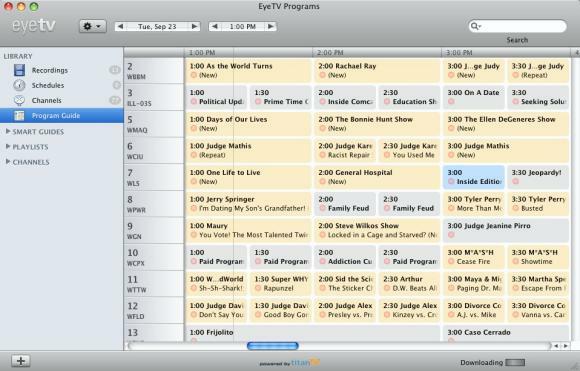 Take a look at this overview of the EyeTV screen. It's intelligently designed to work like iTunes, with bars on the left that when selected, reflect the appropriate contents in the main box. The "Recordings" tab should give you a blank screen, since you haven't gotten anything yet. I clicked on the "Schedules" tab, then the "New Schedule" button. Up came the "Manual Scheduling" screen, which is very straightforward. 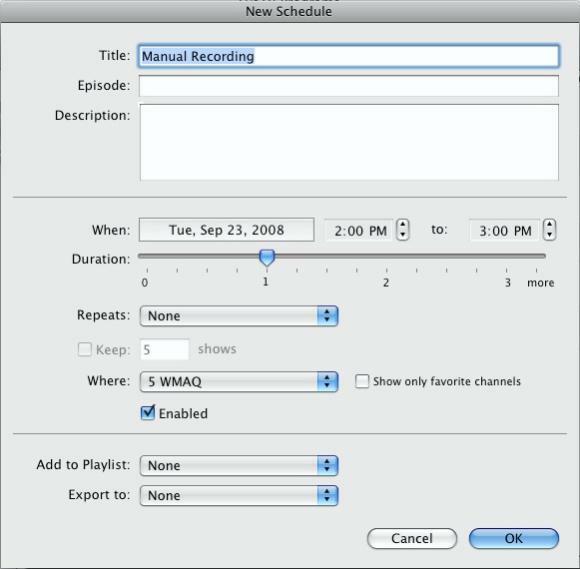 You can set the channel, date, and time of your recording, schedule it to repeat, and many other options. Getting my first recording set up went smoothly and without a hitch. Playback was extremely high quality and sharp. I could fast forward and rewind the recorded show easily. 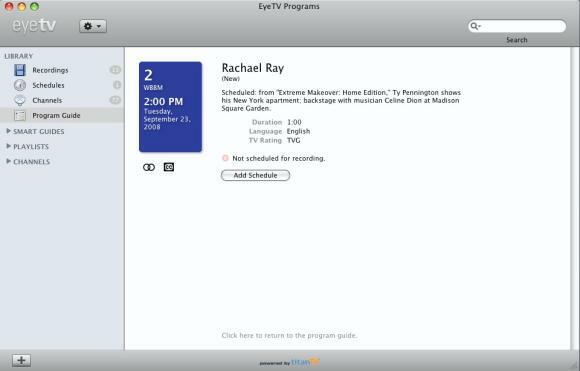 The EyeTV allows you to share your library with other Macs so you can watch your shows throughout your home, and of course, you can watch it easily on your main computer. Oops! I almost forgot to mention that the EyeTV lets you rewind and fast forward live television as well, and will also let you do manual recordings "on the fly." You can use the on screen "remote" or the real remote to do this. Wait a minute... that was kind of a lot of steps, no? After trudging through setting up my shows this way a few times, I found an option in the menus that brightened up my day - the TitanTV built in guide. I discovered that you can enable the built-in guide through the software regardless of whether you have a TitanTV account or not. Opening an account will give you access to remote scheduling, which is a cool feature, but one that I would not use often. Either way, once you download the guides, you open up a world of opportunity for your EyeTV. The built in guide makes it SUPER EASY to find shows you want and record them. It imports all the show's information and all of the channel names automatically. Simply click on a show, and add a schedule - you're done. That's it. Awesome. You can even search for shows that you want to watch. I love "Bizarre Foods" with Andrew Zimmern, so I searched for it using the built in guide. It came up with a whole selection of episodes coming up in the future, for which I scheduled recordings. Now, I don't have to remember to do it later. This is a powerful feature that I will use all the time. I think that many media aficionados have run into the "format" issue. You have a lot of different gadgets and devices and you want to be able to watch your media on all of them. The Elgato really addresses this well by allowing you to export your recorded shows in a cornucopia of formats. Want to watch on your PSP? No problem. 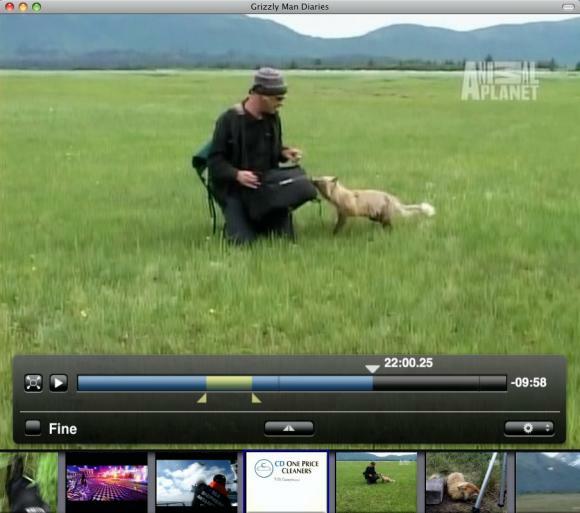 Want to compress in DivX, use it on the web, or view from other cellphones besides the iPhone? No sweat. 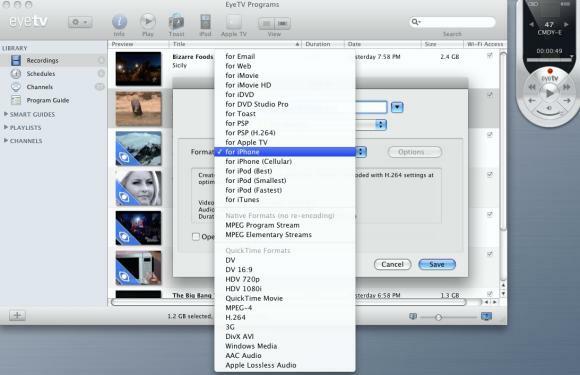 The EyeTV software will also export recorded shows automatically to your Apple TV or iPod. Your shows will show up in your "TV Shows" playlist in iTunes. I have found this very useful as I will transfer shows to my iPod to watch at the gym, or stream to my laptop if I'm just relaxing on the couch. In addition, I can stream to my main television via my NETGEAR EVA 8000. I tested it with the iPod exported format, since everything I had was already encoded that way, but I will probably experiment with higher quality exports as time goes on. 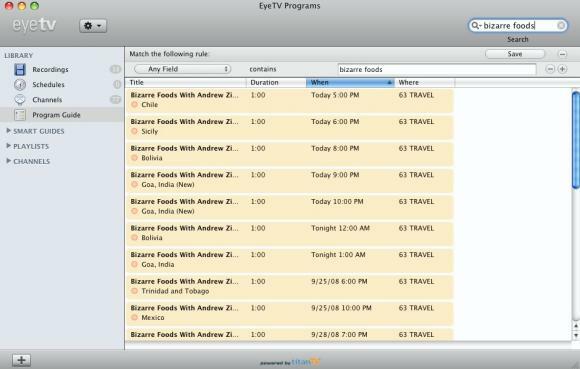 Speaking of streaming, the EyeTV 250 Plus comes with a handy-dandy piece of software called EyeConnect. This software, in simple terms, sets up a webserver from which supported devices on your local network can stream your recorded shows. Note: Before you can stream to your iPhone or iPod Touch via WiFi, you must "prepare" them for WiFi access. This will take extra encoding time and hard drive space. Getting this up and running should be simple, but I experienced a few issues. First of all, one needs to have port 2170 open on their router to allow external devices "in" to view the page. Many people I have known who are skilled with computers and use them every day have no idea how to open ports on a router - so I'm guessing that this could cause frustration for some. You also need to ensure that both EyeConnect and EyeTV are added to your Mac OS firewall as applications that allow incoming access. They should show up in there automatically when you enable them through the EyeTV software, if not - EyeConnect.app is located in /Library/Application Support/EyeConnect, and the EyeTV app should be in your Applications folder as expected. EyeConnect runs in the background, so don't expect a preference pane to show up, or to be able to run the application manually. If you have your router and firewall set up correctly, you should be able to stream your recorded library to your iPhone with no trouble at all. I found the video and audio quality to be exceptional and the web based interface works like any good iPhone app should. Setting up this feature is well worth the effort. Yet another great feature of the EyeTV software is the ability to edit shows. I would think that most folks, like me, would use this feature to eliminate commercials from their recorded programs. Simply select the "Open Editor" option from the "View" menu when you have a recording highlighted, and you'll be whisked away to the simple, yet powerful editor. First, move to the place in the video where you would like to start editing. Click the icon that looks like a small pyramid to insert where you would like to clip. Drag the slider until the portion that you would like to edit out is complete, then click the "gear" icon. Finally, select "Compress," and EyeTV will remove the clip and re-export your recording (which will take time before it's ready.) You can also export clips as separate files. As with many devices, the EyeTV 250 Plus has its strengths and weaknesses. No Monthly Service Fees: I really don't like paying monthly service fees if I don't have to! No Limit to Storage: Well, other than your hard drive space, of course. You can expand infinitely if you want to. Streaming to iPhone and iPod: This is just plain cool. Reasonably Priced: At a suggested retail of $199.99 (online prices vary) it's priced fairly, especially since there are no recurring fees required to use it. Compact: The unit is small and easy to integrate into any desktop setup. Easy to watch on your "big" TV: Since the EyeTV can export to virtually any commonly used format, it's easy to use media extenders such as the NETGEAR EVA 8000, the upcoming SlingCatcher, or other devices to display these files on your TV. 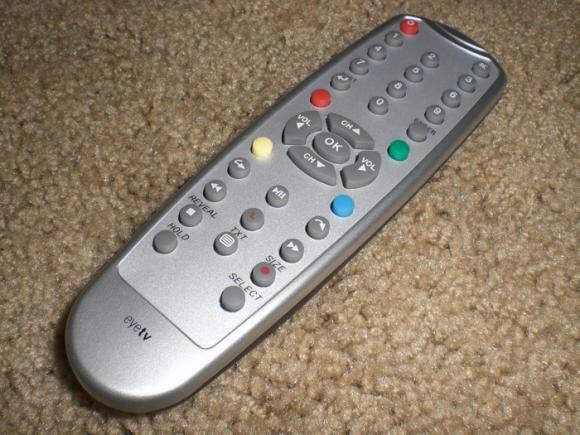 Additionally, if you have your Mac connected directly to your television via DVI or VGA, you can use the remote (either through Front Rowor the EyeTV interface) to control it with ease. TitanTV Subscription "Expires" In 2008: Not sure what exactly this means, but apparently the TitanTV EPG runs out at the end of this year. Strange, because a TitanTV subscription is free according to their website... but this raises the potential for monthly fees, which nobody likes. Encoding Process For iTunes Is Kinda Slow: Don't plan on watching your recorded shows through iTunes right away, since the encoding process takes a pretty long time. I didn't time it, but it takes a while - and I would expect it to. Elgato does sell the Turbo264 encoder to dramatically increase the encoding time, but it comes at an additional cost. Setting up iPhone/iPod Streaming: This is an awesome feature and works well, but requires a bit of fiddling to get working, in the form of opening ports on your router and changing firewall settings. If I had to give the EyeTV 250 Plus a rating, I'd give it an 8 out of 10. It scores high in usability, looks, great included software, and quality. Everything runs and installs smoothly; only the EyeConnect software requires extra "fiddling." If you're looking for a no-strings-attached, easy to use solution for recording your television on your Mac, the EyeTV 250 Plus is sure to fit the bill. 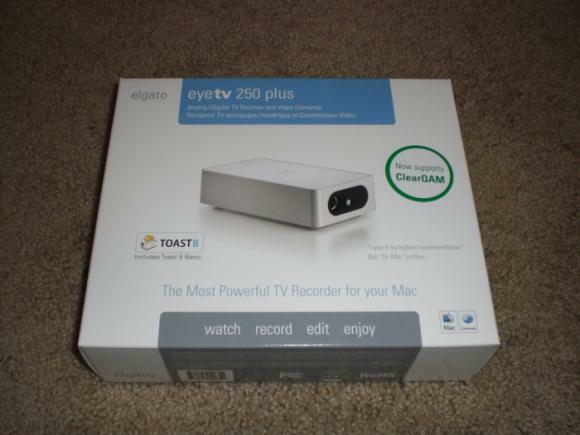 Elgato Systems, having been in the industry since 1992, has produced a long legacy of media products for the Mac - and the EyeTV 250 Plus incorporates some of the best technology they have to offer. I really appreciate your article. It was very informative. I do have one question that you may be able to answer. Can I use an older 667 mrtz Mac G4 laptop as the controlling computer? Also does the remote that Elgato supplies work with the Eglato box or with the computer......I don't think that my computer has any remote capability. The Elgato official site states that G4 processors are supported, but that you must be on Mac OS 10.4.11 or later. My experience is with a Mac Mini 1.83 Intel Core 2 Duo with 3GB of RAM. I've found that it runs like a dream, although encoding and exporting specifically takes quite a while. I'm guessing that, based on your system credentials, that the EyeTV software would run slowly on your system, and that the encoding speed would be very slow. That being said, I would encourage you to contact Elgato directly to see if they have experience with your specific machine. 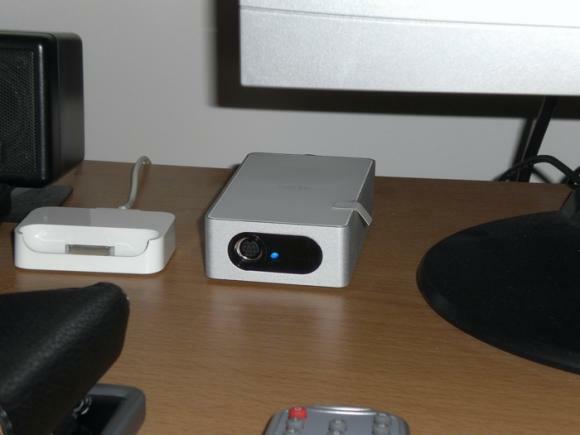 The remote works with the Elgato box, but will also control Front Row on your Mac machine, if your Mac has an IR port. Thanks for the review. I didn't know about the streaming feature, I might use that quite a bit if it works well. That would be very cool. Glad you liked the review! Elgato does make an accessory for the EyeTV which dramatically increases encoding speed. I'd like to get one, but I'm in "money saving mode" right now! It's called the Turbo64, you can see it here.